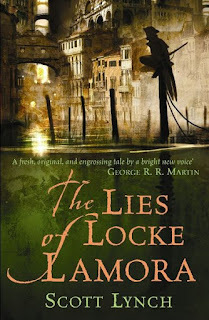 A few years ago, The Lies of Locke Lamora garnered nothing but praise from fantasy readers everywhere. A few days before I finished my last book, my fiance left this rather pointedly behind at my house with some heavy implication that he wouldn't take it back until I'd read it. So, with only a little bit of blackmail, I set to reading a book that I'd had my eye on for a little while. The Lies of Locke Lamora follows the eponymous Locke and his band of flamboyant thieves known collectively as the Gentleman Bastards. They make their living by pulling off high-stake heists that liberate the riches from the nobles of the merchant city of Camorr. This is despite the fact that there is a secret agreement between the nobles and the head of the local thieves: if the thieves stick to the poorer parts of town, then the city guards can be persuaded to turn a mostly blind eye. Things look about to change though, as a mysterious figure going by the moniker the Grey King has been making his presence known by brutally murdering several gang leaders. Though they try to keep low, the Gentleman Bastards find themselves caught in the middle of a war brewing between the Grey King and the King of Camorr's thieves, Capa Barsavi. There's one thing that I need to get out of the way before I continue. The Lies of Locke Lamora is bloody brilliant. First, the plot is fast-paced and constantly defied my expectations of where it would go next. Honestly, I didn't realise that it would get quite so grim as quickly as it did, and I absolutely loved it. It's been a long time since a novel has consistently surprised me whilst still being utterly believable within the context that it has set up. Second, the protagonists are wonderful. There's the title character, Locke Lamora, the thief so well known for his elaborate cons and silver tongue that he has earned a reputation as the fabled Thorn of Camorr. There's the Sanza twins, Calo and Galdo, who are some of the best comic relief characters and really exploit the whole identical twins thing. Bug is the youngest of the Gentleman Bastards as well as the most reckless by far. And finally, there's Jean Tannen, the sensitive brawler of the bunch who I might be just a little bit in love with. I wanted so badly for them to do well, and every loss sustained along the way felt like a punch to the gut. Third, the setting looks to be really interesting, if a little underexplored. One of the most prominent features in the landscape of Camorr are the towers made of Elderglass, a mysterious substance left behind by the previous civilisation and seemingly indestructible. Where they came from and what that previous civilisation were like isn't really explored in great detail, but I'm seriously hoping that more is revealed as the series progresses. Likewise, I'm looking forward to learning more about the magic system of the Bondsmagi, a group of elite magicians, as well as the different gods introduced. I don't think that I could be any more enthusiastic about this book if I tried.